Home » free online event for writers , free online workshops , PD12 , promo day , promotional event for writers , virtual tour , writing industry event » Can you host a PD12 promo on your site? As we get nearer to the date of this years Promo Day event I'd like to tour the web in order to increase the buzz about this years event. 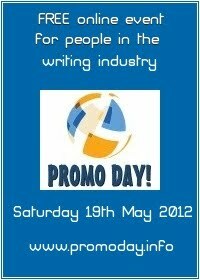 Do you have a website or blog where you can post a promo article, guest post or interview about Promo Day? Do you have a twitter account? Can you do a LIVE twitter interview about Promo Day? Do you have a Facebook profile/page? Can you do a promotional wall chat or add a Promo Day feature to your notes section? Do you have a Google+ profile/page? Can you organise a hangout to chat about this years Promo Day event? Do you have a newsletter? Can you include a feature, interview etc... about Promo Day to let your readers know? Got any other ideas for how to spread the word about the event? I'd love to hear them. Your are also encouraged to share the Promo Day banner on your sites and networks. Thank you in advance for supporting Promo Day and helping to make this year a huge success.